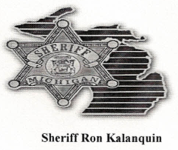 On Thursday 09-26-2013 at 12:37 AM, Lapeer County Sheriff’s Deputies responded to an injury traffic crash on Columbiaville Road to the east of North Lake Road in Columbiaville. TRISH WHITE age 33 from Columbiaville was traveling east on Columbiaville Road operating a 1998 Cadillac. WHITE failed to navigate a curve and departed the south side of the roadway. The vehicle traveled a negative embankment before striking a tree. WHITE was the lone occupant. WHITE was ejected from the vehicle and pronounced deceased at the scene. The Lapeer County Sheriff’s Office was assisted at the scene by Columbiaville Fire Department and Marathon Township First Responders. The roadway was closed for about 2 1/2 hour for investigative purposes. Preliminary investigation supports that excessive speed and alcohol are contributing factors. The crash remains under investigation by the Lapeer County Sheriff’s Office. Anyone with information is requested to contact Detective Sgt. Jason Parks at 810-245-1381.